My latest love for cranberries has allowed me to experiment using them in different Indian recipes and cranberry thokku or pachadi is one such recipe. 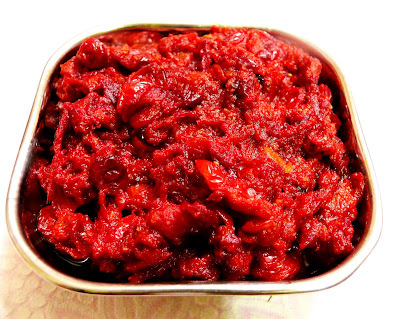 Cranberries pairs well with garlic, sesame seeds and other spices to make this a spicy thokku/pachadi. After trying with Cranberry rice and Cranberry vadu, this vibrant red thokku/pachadi was a great hit at our home. 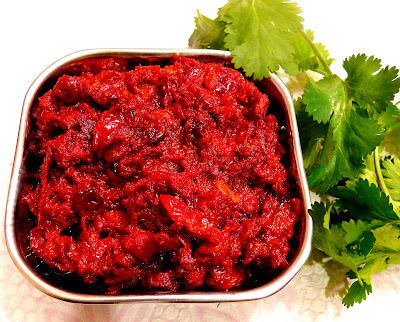 An Andhra preparation, cranberry thokku/pachadi goes well with rice, chappati, idli or dosai. Like any other pickle, it is a great combination with Thayir Sadham/curd rice or mix in with hot steaming rice. Dry roast sesame seeds in a pan until they pop. Cool and powder in a mixture. Do not add water. Add the turmeric, salt and chilli powders. Mix well and turn off heat. 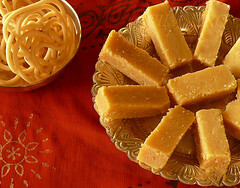 Mix in the sesame powder and jaggery. Let cool and store in a dry, clean glass container with a tight lid. Serve with rice, chappati, idli or dosai. Relish this Thokku/Pachadi mixed with hot steaming rice or Curd Rice. Tips: Use nice red cranberries. Typically Idhayam sesame oil/gingely oil is used for making pickles or thokku, you could use oil of your choice. Adjust spice levels according to your taste buds. 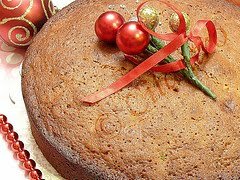 Wowo i would have never thought about making them with cranberries. The color is something of a delight. Cranberry perhaps like mango is best suited for thokku. looks so good. Thanks Happycoo, Indhu and Mrs.Kannan. Indo, it was indeed very tasty. It was my first time trying out with cranberries. Do try and let me know. Divya, yes I remember your recipe for the pickle and I have to try it out soon...and for the picture, there isn`t any changes that I am aware of. Thanks Divya. Lovely pickle Cilantro. Let me check the rice too. What a blessing for a Thanksgiving treat. I gave it to an American friend and she went ga-ga about it. Her friends who also tasted it want the recipe. This is what I call adding colour (red! )to Thanksgiving. Here are my thanks! Thank you Mini for your feedback. I am glad you and your friends like it. Happy Thanksgiving! You get to make use of the added coins inube.com/ or cash to purchase things official guide from the video game"s shop such as boosts, Guide to Download Game Killer Android App, APK, iOS brand-new product, etc.You reach Game Killer show off before your noob friends. Show them your impossible-to-achieve-high-score, Game Killer Download as well as they will probably pass away of heart attack on that area. This stroller has a huge storage space readymag.com/ bin, easy fold, pop open Website harness, and also supplies adjustable WHEN BUYING A JOGGING STROLLER, what TO LOOK monitoring, adjustable handlebar, shocks.